PAMM-system: it’s time to make wise decision on investing! InstaForex Company introduces a new instrument for trading on the international currency market Forex. PAMM-system consists of one or more investors’ accounts which are used by the managing trader. PAMM-system function is managing the total capital of the investor and distributing profits and losses between all participants proportionally to the investments. PAMM-account is a special trading account for operating in the financial markets by means of which a trust manager controls both his own capital and the investor’s one. And the funds are not transferred from account to account of the manager. The managed PAMM-account belongs to the grantor, but all trading operations are carried out by the managing trader without the right of funds withdrawal. Amid this, all market risk is carried by the grantor. PAMM-system affords an excellent opportunity of collective funds investment for traders. Features of these account types lie in that a PAMM-account of the Investor can invest funds only in accounts of PAMM Traders, and PAMM-accounts of the Traders in their turn can accept investments from PAMM Investors accounts. PAMM-system has a few essential distinctions from the trust management, and one of them is that the manager trades primarily with his own money and even beginning working with investors he is not allowed to withdraw his funds. An important characteristic of PAMM-system is risk diversification – funds investment by PAMM-investors in PAMM-accounts of different managing traders that decreases the risk of loss bearing. Special for PAMM-traders InstaForex Company has devised a unique innovation in the system: investments intake from different Investors on one PAMM-account that is not offered by any of brokerage companies in the world. One-of-a-kind technique of funds calculation is the creation of the company’s management and the offspring of the programmers’ annual work. 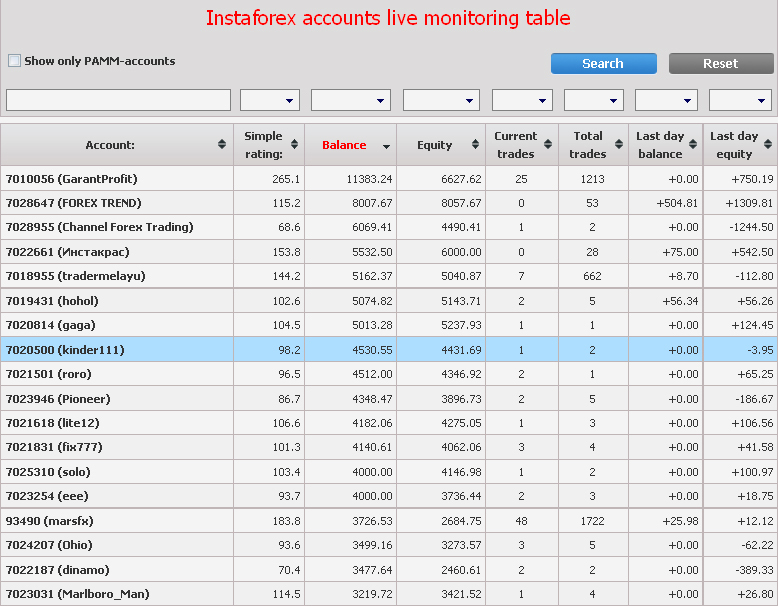 As of today, PAMM-account system by InstaForex Company comes as the best one due to its opportunities both for managing traders and investors. This entry was posted on Wednesday, March 24th, 2010 at 6:50 pm	and is filed under Trading. You can follow any responses to this entry through the RSS 2.0 feed. You can leave a response, or trackback from your own site.